[Jesus said,] "All who do evil hate the light and refuse to go near it for fear their sins will be exposed. 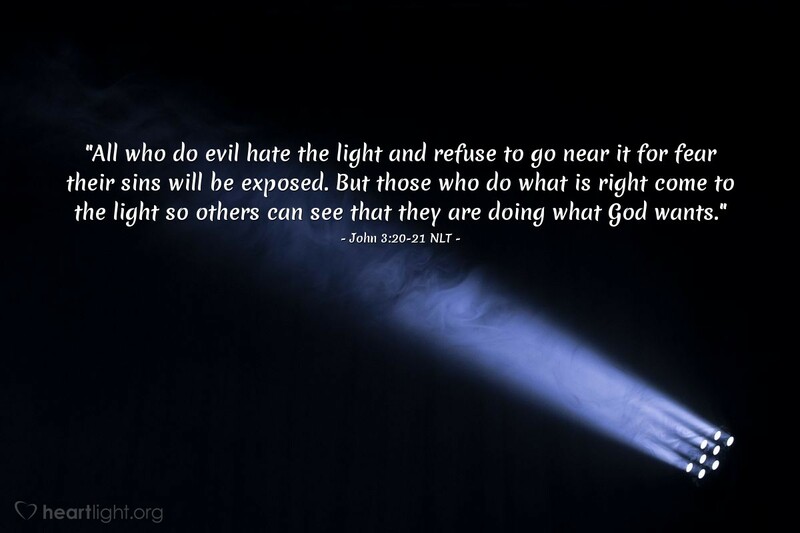 But those who do what is right come to the light so others can see that they are doing what God wants." A life dedicated to God comes to his light. A person living this kind of life doesn't fear judgment or rejection or truth. Any tendency and temptation toward falsehood, dishonesty, sinfulness, greed, ... can be overcome through God's grace when those seeking righteousness come to the light. So the question you and I face each day is very simple: Do I gladly come to the light to let God show me his grace in ways that allow me to see my sinfulness, shallowness, and selfishness and to be transformed? My desire to open my life to the light of God's truth and holiness reveals my desire to do what is right. My reluctance reveals how the power of sin has come into my life and my heart. Almighty Father, God of holiness and grace, search me and try me and convict me of my sin. I want to be holy and blameless, not just by your gift of grace, but also through the sanctifying power of your Spirit at work to transform me to be more and more like Jesus, in whose name I pray. Amen.